Udo Boeken, et al. CARDIA Exploring the Pleiotropic Effects of Levosimendan – Impact on Systemic Inflammatory Parameters and Molecular Salvage Pathways by Modulation of Cytokine Levels and Tissue Apoptosis Rate. (2017) J Heart Cardiol 3(1): 22-30. © 2017 Udo Boeken. This is an Open access article distributed under the terms of Creative Commons Attribution 4.0 International License. Introduction: Although levosimendan is commonly used, recent clinical trials remain ambiguous. Extra-corporeal circulation induces Ischemia/Reperfusion Injury (IRI) and inflammation. Methods: In our study, male rats (400 - 500 g) were cannulated, intravenously treated with 12 μg/kg body weight levosimendan (n = 4) or vehicle solution (n = 5) and connected to a heart-lung machine. To induce IRI, 45 min circulatory arrest was performed. After reperfusion, rats were euthanized. Cytokines were analyzed by ELISA and salvage pathways and apoptosis by western blot. Results: After circulatory arrest, heart rate and blood pressure recovered faster in the levosimendan group. The need for buffering solution and catecholamines was 40% lower in the levosimendan group. Cytokines increased in both groups during the procedure but levosimendan diminished the increase of IL-6(- 44 %). Whereas activation of AKT did not differ between groups, p44-42 MAPK (+ 29%) and p38 MAPK (+ 17%) increased and STAT3 (- 55%) decreased in levosimendan heart samples. PARP-cleavage was 35% decreased in the levosimendan group indicating lower apoptosis. Conclusions: Application of levosimendan seems to affect salvage pathways, cytokines and apoptosis. Levosimendan treated rats recovered faster and showed beneficial changes. These findings may serve our understanding of levosimendan in the context of IRI, allowing better patient tailored drug application. Cardiovascular diseases such as acute myocardial infarction and cardiogenic shock are globally a leading cause of mortality and morbidity[1,2]. Modern cardio-thoracic surgery offers a variety of potential treatment options for the different kinds of cardiovascular burdens[3,4]. However, a plurality of cases is still associated with significant risk of organ damage and death. Up to 7 % of all patients suffering from acute myocardial infarction will develop a cardiogenic shock with an overall mortality risk of 65%. In addition, therapy options employing extracorporeal circulation with heart lung machines or Extracorporeal Membrane Oxygenation (ECMO) systems have a 2 - 10% risk of systemic inflammatory response syndrome, which may lead to lethal multiple organ dysfunction[6,7]. Furthermore, abrupt reperfusion of occluded myocardial vessels can extend hypoxic damage in the heart caused by Ischemia/Reperfusion Injury (IRI). In addition, intensified glycemic control and reperfusion therapy may induce an up regulation of endothelial progenitor cells and decrease myocardial damage during acute ST elevation myocardial infarction leading to reduced heart failure disease progression. Common pharmacological shock therapies with catecholamines increase myocardial oxygen consumption with elevated demand for oxygen and therefore may further increase myocardial hypoxia. Moreover, potential pro-inflammatory secondary effects of norepinephrine are described in the literature. To avoid these complications, modern guidelines for the treatment of post-infarction cardiogenic shock and heart failure recommend the application of levosimendan. Troponin C is a cardiac protein able to bind calcium ions and there by regulating the building of new sarcomere cross-bridges for myogenic contraction. Levosimendan (Simdax®) binds to cardiac troponin C and acts as a pharmacological calcium sensitizer increasing cardiac contractility[14,15]. This positive inotrope effect is accompanied by opening potassium channels in smooth muscle cells leading to vasodilation. In addition, levosimendan offers cardio protection by opening ATP-dependent potassium channels in cardiac myocytes preventing them from apoptosis. Although therapeutic application of levosimendan is common today, clinical trials are still ambiguous about the net advantage of levosimendan administration. On the one hand, a systemic review with 88 trials and a meta-analysis of 49 trials did not find an association between levosimendan therapy and mortality in lower risk of bias trials at all. On the other hand, smaller meta-analyses of different clinical studies reported advantages of levosimendan application leading to reduced mortality, shorter intensive care unit stay and decreased postoperative renal failure in patients undergoing levosimendan treatment[19-21]. The uncertainties of clinical trials strengthen the need of further investigation, both on experimental and clinical level, enabling better patient tailored therapy schemes. Current experimental studies suggest that oral levosimendan treatment after occlusion of the left anterior descending coronary artery may reduce infarct size and cardiac remodelling as well as myocardial inflammation and edema[22,23]. In a model of deep hypothermic circulatory arrest, levosimendan showed better inotropic and lusitropic effects than epinephrine during rewarming. In addition, rats treated with levosimendan during reperfusion in case of Extracorporeal Circulation (ECC) showed improved cardiac output compared to epinephrine treatment. Nonetheless, potential beneficial effects of preventive levosimendan treatment and their molecular pattern of action in case of ECC, global IRI and severe inflammatory response are still not fully understood. Detailed experimental in vivo analyses especially focusing on the protein levels and regulation of salvage pathways are still missing in this context. This work was designed to study the mechanisms of preventive levosimendan application prior to ECC and global ischemia. On the protein level different components of key intracellular signalling path-ways were studied, and we hypothesized that levosimendan may attenuate cytokine levels; molecular salvage pathways as well as apoptosis rate following profound IRI. To our best knowledge, this is the first report examining changes in molecular salvage pathways following preventive levosimendan application in the context of ECC and IRI. This study was approved by the appropriate agency LANUV (Landesamtfürnatur, Umwelt Und Verbraucherschutz NRW) and carried out in accordance with German and European guidelines of laboratory animal care (approval number 84-02.04.2013.A436). All animals were kept under standard laboratory conditions and offered food and water ad libidum. Male Wistar rats from Janvier Labs (Le Genest-Saint-Isle, France) weighing between 400 and 500 g were randomly divided into two groups. Before undergoing ECC, animals were either treated intravenously with 12 μg/kg body weight levosimendan (Levo; n = 4) or vehicle solution (Control; n = 5). In order to guarantee comparable experiment conditions between the two groups and good scientific practise as well as clinical relevance, exclusion criteria were defined before the beginning of the study. Animals were excluded from the analyses when one or more of the following conditions occurred: Low haemoglobin concentration during the procedure (Hb < 5.0 mg/dl), low mean arterial pressure not responding to norepinephrine application (MAP < 40 mmHg), prolonged ventricular fibrillation and fail-ure to convert to sinus rhythm during rewarming (no conversion till 35°C). The study was designed with n = 7 animals per group. Three animals were excluded due to low heart rate (Control: n = 1; Levo: n =2), one animal was excluded due to insufficient cooling (Control) and one because of anaesthesia problems (Levo). All other animals were included in the study (Control: n = 5; Levo: n = 4). In order to induce global IRI and systemic inflammation, rats were exposed to ECC as described before by our group[26,27]. In brief, animals were intubated and anesthetized with 2.5% isofluran (AbbVie, Wiesbaden, Germany) und analgised with 5 μg/kg bodyweight fentanyl (Rotexmedica, Trittau, Germany) per hour. Median sacral artery and right intern jugular vein were cannulated and connected to a customized heart lung machine. Before the start of the ECC500 μl levosimendan (12 μg/kg bodyweight) was administered intravenously with a syringe pump over 5 min. Due to low water solubility, a stock solution containing 1.25 mg levosimendan, 10 mg povidon and 2 mg citrate dissolved in 1 ml ethanol was prepared. Final preparation of levosimendan solution for application was obtained by diluting the respective amount of stock solution with 0.9% NaCl (based on US patent 6730673). Control animals received the corresponding vehicle solution (levosimendan-free stock solution in 0.9% NaCl). MAP was measured continuously by a femoral artery cannula. Electrocardiogram, peripheral oxygen saturation and body temperature were also monitored throughout the whole procedure (t1 -t12). After priming with 10 ml hy droxyethylstarch (Fresenius Kabi, Friedberg, Germany) rats were connected to the heart lung machine. After 30 min of cooling the machine was paused for 45 min deep hypothermic circulatory arrest at 16°C. Afterwards, ECC was restarted and the animals subjected to 40 min of rewarming and additional 60 min reperfusion phase at 37°C body temperature. Subsequently, animals were euthanized; organs rinsed with ice cold 0.9% NaCl solution (B. Braun, Melsungen, Germany) and snap frozen in liquid nitrogen. To maintain physiological vital parameters, supplementation of bicarbonate (NaBiC 8.4%, B. Braun, Melsungen, Germany), trometamol (Tris 36.34%, B. Braun, Melsungen, Germany), carbondioxide and altered ventilation were used, when necessary. Norepinephrine (Arterenol, Sanofi-Aventis, Frankfurt, Germany) and epinephrine (Suprarenin, Sanofi-Aventis, Frankfurt, Germany) were applied in case of low arterial pressure or heart rate, respectively. Arterial blood gas analyses (ABL 700, Radiometer, Copenhagen, Denmark) and blood count (Vet abc, Scil animal care, Meerbusch, Germany) were performed throughout the procedure. Blood samples were taken at six predefined times (tA: at the beginning of cannulation, tB: start of ECC, tC: at 25°C during cooling, tD: rewarming phase at 20°C body temperature, tE: at 35°C during rewarming, tF: prior to euthanasia). The influence of a preventive levosimendan application on circulating cytokines after ECC and global IRI was investigated by ELISA. Circulating levels of IL-6, IFN-γ and TNF-α were measured in heparinized blood samples using a customized multi-cytokine ELISA kit (Inflammatory cytokines ELISA array kit, Qiagen, Hilden, Germany) following the manufacturers’ instructions. Cytokine concentrations of the groups were compared at two time-points (tA: at the beginning of cannulation; tF: prior to euthanasia). To investigate changes in protein levels induced by levosimendan application, Western blots of heart tissue samples were performed. Snap frozen myocardial samples were powdered, then suspended in M-PER buffer (Thermo Scientific, Waltham, USA) containing protease and phosphatase inhibitors and finally homogenized. Samples were centrifuged at 15,000 G for 15 min and supernatants collected. Semidry blotting transferred 10% SDS-PAGE gels containing 30 μg of protein per sample to PVDF mem-branes. Membranes were incubated overnight in diluted solutions of primary antibodies against Phospho-p44/42 mitogen-activated protein kinase (p-p44/42 MAPK), total p44/42 mitogen-activated protein kinase (p44/42 MAPK), phospho-signal transducer and activator of transcription 3 (p-STAT3), total signal transducer and activator of transcription 3 (t-STAT3), phospho-p38 mitogen-activated protein kinase (p-p38 MAPK), total p38 mitogen-activated protein kinase (p38 MAPK), phospho-protein kinase B (p-AKT), total protein kinase B (t-AKT) and poly (ADP-ribose) polymerase 1 (PARP-1) (all Cell Signalling, Danvers, USA). Secondary antibody (goat anti-rabbit HRP, Jackson, West Grove, USA) was applied for 60 - 180 min diluted 1:5,000 - 1:10,000 in 5% skim milk TBST. All antibodies were applied according to manufacturer’s instructions. Chemiluminescence signal (Quantum chemiluminescent HRP substrate, Advansta, Menlo Park, USA) was recorded using a CCD-Bio imaging System (UVP, Upland, USA). Densitometry was performed using ImageJv 1.46 (Wayne Rasband, National Institutes of Health, USA). Vital and blood parameters, drug doses as well as ELISA data are shown as real values. Western blot data are shown as relative values and normalized to the vehicle controls. Therefore, each value of the two groups was divided by the mean of the vehicle control group, which serves as 1. Statistical analyses were performed by Prism 6 (Graph Pad Software, La Jolla, USA) using non parametric Mann-Whitney tests presuming statistical significance for p < 0.05. Due to the exclusion criteria the sample sizes were reduced in both groups leading to relatively small group sizes. In order to maintain best possible statistic relevance, graphs are plotted as box and whiskers from minimum to maximum indicating the median of each group as well as any individual data point. In addition, cohen’s effect sizes and power analyses were evaluated. Results in the text are presented with the standard deviation. Vital parameters were monitored throughout the entire experimental procedure. Before and dur-ing cannulation heart rate did not differ between the two groups (292 ± 11 bpm vs. 283 ± 24 bpm for Control and Levo, respectively at t1). During cooling heart rate dropped in both groups simultaneously. At the beginning of the circulatory arrest, three vehicle controls (37 ± 6 bpm) and one levosimendan treated animal (40 bpm) showed slow cardiac activity in the electrocardiograph despite the deep hypothermic state. When compared to controls, levosimendan treated animals showed a faster recovery of the cardiac rhythm after the arrest reaching distinctly higher heart rates during rewarming and during early reperfusion (mean heart rate of 170 ± 60 bpm vs. 60 ± 14 bpm at t7 for Levo and Control, respectively; cohen’s effect size d = 2.10, power = 73.8 %). In the later course of the experiment this effect vanished and levosimendan treated animals showed decreased heart rate as compared to the vehicle controls at the final time point prior to euthanasia (193 ± 98 bpm vs. 274 ± 23 bpm at t12 for Levo and Control, respectively; cohen’s effect size d = 1.28, power = 35.8 %) [Figure 1A]. MAP monitoring showed a tendentially higher course for Levo prior to ECC and during cooling but no differences at later time points, possibly due to active MAP management by altered perfusion rate and norepinephrine application [Figure 1B]. During the entire procedure at six predefined time point’s blood samples were taken and arterial blood gas analyses were performed. Lactate concentration distinctly increased in both group during the reperfu-sion phase, presumably as a response to the IRI. Prior to euthanasia mean lactate concentration in vehicle controls was about 17-times increased compared to the beginning of the procedure (Vehicle control: tA: c = 2.1 ± 0.95 mmol/l; tF: c = 35.0 ± 8.86 mmol/l). Levosimendan treated animals showed an increase of lactate concentration by about 19-times (Levo: tA: c = 2.4 ± 0.75 mmol/l; tF: c = 45.3 ± 14.13 mmol/l) [Figure 1C]. Plasma potassium concentration showed comparable characteristics and showed a twofold and 2.5-fold increase during the entire experiment for Control and Levo, respectively [Figure 1D]. Heart rate (A) and mean arterial pressure (B) were monitored throughout the entire procedure at pre-defined time points and showed partial trends favouring either group, however without any statistical significance. t1: pre-cannulation, t2: cannulation, t3: start of extracorporeal circulation, t4: 15 min cooling, t5: 25 min cooling, t6: DHCA, t7: 20.0°C rewarming, t8: 27.5°C rewarming, t9: 35.0°C rewarming, t10: 15 min reperfusion, t11: 45 min reperfusion, t12: euthanasia). C, D; Blood gas analyses were performed at six pre-defined time points. Lactate concentration increased remarkably in both groups following IRI with 17-fold (Control) and 19-fold (Levo) higher values at the end of the experiment when compared to initial values (C). Following a similar pattern potassium levels increased significantly during rewarming in both groups. tA: beginning of cannulation, tB: start of extracorporeal circulation, tC: 25°C cooling, tD: 20°C rewarming, tE: 35° C rewarming, tF: euthanasia. In order to maintain physiological pH-value, metabolic acidosis during rewarming and reperfusion was pharmacologically treated with bicarbonate and trometamol application with a marked trend favouring Levo (A). The need for epinephrine and norepinephrine administration to treat bradycardia and hypotension was reduced in Levo group as compared to Control (B), with a particularly strong trend observed in case of norepinephrine. In order to eliminate secondary effects like extended hypoxia caused by low MAP as mentioned in the exclusion criteria, drugs were administered when needed. Potential metabolic acidosis was equal-ized by bicarbonate and trometamol. Whereas vehicle controls needed on average of 1.66 ± 2.22 ml bicarbonate and 2.52 ± 2.15 ml trometamol resulting in a mean total buffer volume of 4.18 ml, in Levo animals only a mean total volume of 2.48 ml buffers (0.53 ± 0.46 ml bicarbonate and 1.92 ± 0.56 ml trometamol) was necessary to control for the pH value (bicarbonate: cohen’s effect size d = 0.67, power = 13.4%; trometamol: cohen’s effect size d = 0.34, power = 7.1%) (Figure 2A). These results were corroborated by the observed reduction of necessary catecholamine application in the Levo group: Compared to Control group, in Levo group a 30% reduction in epinephrine administration (0.23 ± 0.39 ml vs. 0.32 ± 0.46 ml for Levo vs. Control, respectively) and a 83% reduction in norepinephrine administration (0.05 ml ± 0.06 vs. 0.3 ± 0.26 ml for Levo vs. Control, respectively) was observed (epinephrine: cohen’s effect size d = 0.22, effect size = 5.9%; norepinephrine: cohen’s effect size d = 1.23, power = 33.6%) (Figure 2B). Circulating cytokines were measured by ELISA prior (at the beginning of the cannulation; tA) and after IRI (prior to euthanasia; tF). Here, IFN-γ concentration did not differ between the two groups before ECC (tA: 124.85 ± 50.45 pg/ml and 113.74 ± 17.67 pg/ml for Control and Levo, respectively). Following IRI, a 1.7-fold increase in both groups was observed (tF: 210.31 ± 81.49 pg/ml and 191.74 ± 43.54pg/ml for Control and Levo, respectively) (Figure 3A). TNF-α concentration did not differ before the ECC (tA: Vehicle control: c = 14.01 ± 9.55 pg/ml; tA: Levosimendan: c = 26.64 ± 5.12 pg/ml). ECC and hypoxia increased the TNF-α concentration in both group clearly and statistically to a significant level (pre-ECC vs. post-IRI: p = 0.008 for Control and p = 0.029 for Levo) leading to a slightly higher (+ 19%) concentration in control animals compared to levosimendan treated animals (3,402.24 ± 824.67 pg/ml vs. 2,855.66 ± 1,697.50 pg/ml in Control and Levo, respectively, at tF; cohen’s effect size d = 0.43, power = 8.4%) (Figure 3B). This inter-group difference was more pronounced when a key pro-inflammatory cytokine, IL-6 was evaluated. Here, a remarkable IL-6 increase was observed in both groups, but levosimendan application diminished this effect by 44 % (155.26 ± 64.67 pg/ml in Control vs. 87.41 ± 32.33 pg/ml in Levo at tF; cohen’s effect size d = 1.27, power = 35.4 %) (Figure 3C). 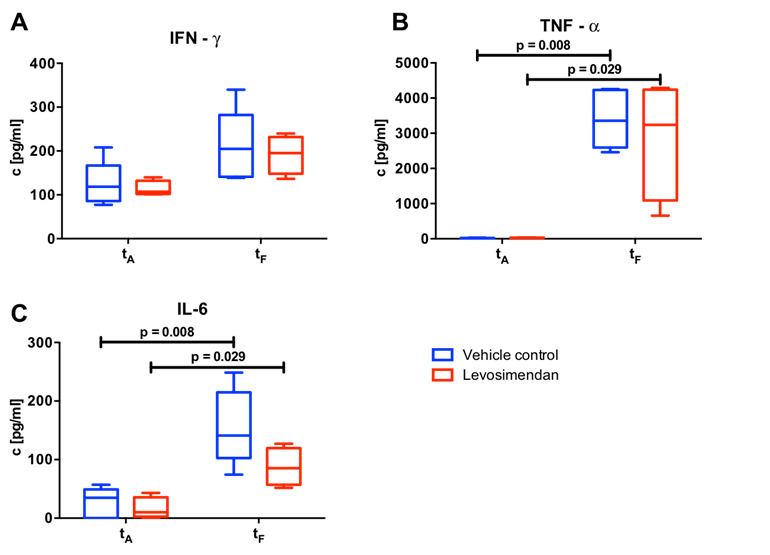 Concentration of circulating plasma cytokines IFN-γ (A), TNF-α (B) and IL-6 (C) were measured by ELISA at two predefined time-points marking an early stage and the final point of the experiment. Animals with preventive levosimendan application before initiation of extracorporeal circulation (Levo: n = 4) were compared with animals with alternatively vehicle application (Control: n = 5). tA: beginning of cannulation, tF: euthanasia. Western Blot analyses of key intracellular signalling pathways in heart tissue samples. Animals with preventive levosimendan application before initiation of ECC (Levo; n = 4) were compared with control animals (Control; n = 5). Activation of p44-42 MAPK (A, a), STAT3 (B, b), AKT (C, c) p38 MAPK (D, d) and cleavage of PARP (E, e) were analysed. Results of Levo are represented as normalized to respective Control with Control value set =1. To investigate changes in protein expression and activation of salvage pathways, Western blot analyses of heart tissue samples were performed. Mean relative activation of p44-42 MAPK was increased by 28% in animals receiving preventive levosimendan therapy compared to vehicle controls (cohen’s effect size d = 0.78, power = 16.5 %) (Figure 4Aa). In contrast, levosimendan application led to more than 50% reduction in the mean relative activation of the STAT3 pathway after IRI (cohen’s effect size d = 1.21, power = 32.7%) (Figure 4Bb). While mean relative activation of AKT did not show a remarkable difference between the two groups (Figure 4Cc), levosimendan treatment enhanced the activation of the p38 MAP kinase (+ 17%) after IRI (cohen’s effect size d = 0.29, power = 6.5%) (Figure 4Dd). Moreover, apoptotic activity as assessed by cleavage of PARP-1 was decreased by 35% in Levo group compared to Control, indicating a reduced level of apoptosis by preventive levosimendan treatment in our model (cohen’s effect size d = 1.50, power = 46.3%). This in vivo study was designed to investigate the mechanisms of levosimendan action after preventive application in the context of extracorporeal circulation and global IRI. Using a delicate small animal model of ECC and hypothermic circulatory arrest, the herein presented results demonstrate that levosimendan treatment affects circulating cytokine levels, and modulated the level of activation of key intracellular pathways, including p44-42 MAPK and p38 MAPK pathway, leading to a decreased myo-cardial apoptosis, collectively indicating an improved myocardial handling of IRI after levosimendan application. Although today levosimendan is routinely used in the clinics, its net beneficial effect is still uncertain. While current clinical studies mainly focus on clinical parameters and outcome, so far ex-perimental studies have largely focused on in vivo experiments with a strong emphasis on functional outcome parameters. In this study we have aimed at bridging this gap by designing a clinically relevant small animal model of ECC and IRI allowing us to investigate signalling pathways and changes on the molecular level. The presented data were obtained using a previously established rat model employing a custom made miniaturized heart lung machine. Monitoring of vital parameters and pharmacological treatment was kept as much as possible close to the clinical routine. When levosimendan treated animals were compared to control animals, heart rate did not differ prior to IRI induced by circulatory arrest, but the recovery of a stable rhythm was distinctly faster afterwards (Figure 1A). 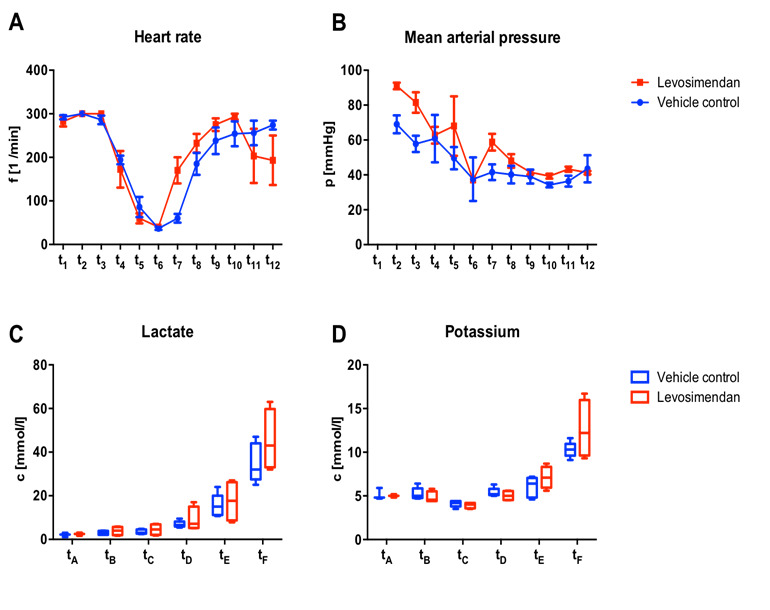 A stable cardiac rhythm is a prerequisite for hemodynamic stability, and our findings indicate an improvement in cardiac function, which may be related to the calcium sensitizing effect of levosimendan. Mean arterial pressure was comparable between both groups during rewarming and reperfusion. However, a remarkable decrease in the overall need of norepinephrine application was noted in the levosimendan group, supporting the previously suggested improvement in hemodynamic stability (Figure 1B, 2B). This is of particular interest, as on the one hand, an increased blood pressure in Levo group appears to be contrary to the vasodilative effects of levosimendan. On the other hand, considering the improved cardiac rhythm, the overall net improvement of cardiac output induced by levosimendan may be well explained, confirming previous reports. In line with this, Joshi et al. Described optimized cardiac output by levosimendan in patients undergoing cardiac surgery for congenital heart defects. In our model circulating potassium and lactate concentrations clearly increased in both groups, which is an unpreventable aspect of the induced global IRI and a typical finding of other groups in rodent models of cardiopulmonary bypass[26,27,29]. However, taking into account the severe deterioration of these parameters, it appeared that both groups considerably suffered from the procedure, underlining the robust level of injury induced by the hypothermic circulatory arrest. IRI is mainly caused by oxidative stress and inflammation. Oxidative stress and inflammation itself are bred by a variety of different causes and may additionally extend the initial disease burden by evoking atrial fibrillation as well as a trial and ventricular arrhythmia[30,31]. During the inflammatory cascade, different cytokines like IL-6 and TNF-α are released. All analysed cytokines in our study (IFN-γ, TNF-α, IL-6) increased during the experiment, which matches the expected outcome (Figure 3). Before applying ECC, no differences in cytokine concentrations were found between the groups. We found a remarkable reduction in circulating IFN-γ (-19%) and IL-6 (-44%) concentrations after levosimendan treatment. While Parissis et al. Described decreased concentration of TNF-α and IL-6 after multiple levosimendan infusions in patients with chronic heart failure, Tasal et al. were able to prove this effect also after single dose applications. Our data obtained in the presented small animal model of ECC are in line with the clinical experience. Anti-inflammatory therapies with α-lipoic acid could significantly reduce inflammatory stress and have shown beneficial effects in the treatment of transient takotsubo cardiomyopathy[35,36]. These findings support the potential beneficial effect of preventive levosimendan treatment as we demonstrate here and possibly to be explained by pleiotropic effects. To gain further insight into the mechanistic action of levosimendan, we analysed the activation of key intracellular signalling pathways, where the p44/42 MAPK pathway showed an increased activation. 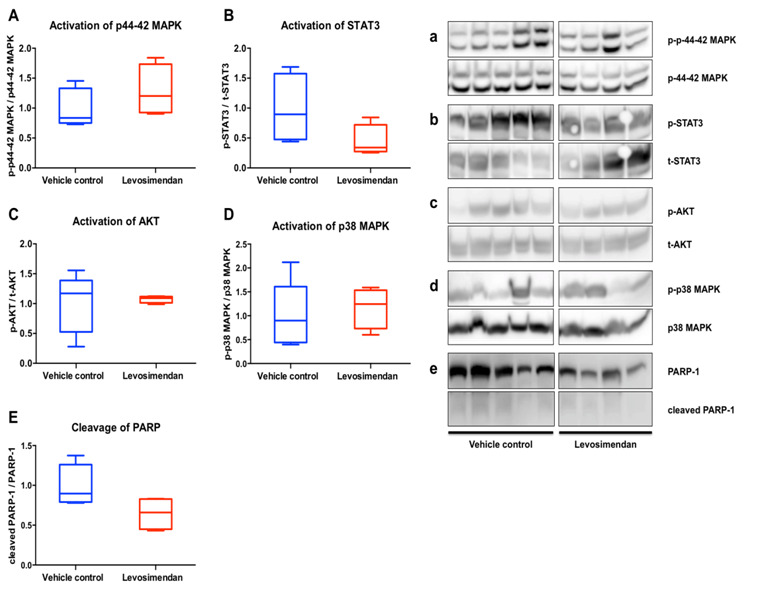 Together with AKT, p44/42 MAPK is part of the protective Reperfusion Injury Salvage Kinase (RISK) pathway. Du Toit et al. Showed an increase in p44-42 MAPK phosphorylation after levosimendan treatment in isolated guinea pig hearts and hence demonstrated a link between activation of RISK pathway on the one hand and increased infarct size on the other hand. While we did not detect notable changes in the activation of AKT, we can demonstrate in an in vivo setting the enhanced p38 MAPK activation by levosimendan. Previously, an activation of the p38 MAPK and the RISK pathway had been demonstrated in vitro in isolated endothelial cells, suggesting that endothelial NO production may also play a role in the protective effect of levosimendan. In an extension to these previous findings our current data suggest that these mechanisms may also be active in a clinically relevant in vivo model of global IRI. In contrast to findings on p44/42 and p38 MAPK, activation of STAT3 was decreased after levosimendan treatment in our experimental setting. The latter pathway has been described to be cardio-protective pathway in case of I/R injury in rodents, possibly comparable to the cardio-protective effects of STAT5 activation in humans. Unfortunately, no comparable analyses of STAT3/5 regulation in regard to levosimendan have been issued by now. Nevertheless, apoptotic activity, as indicated by cleavage of PARP was clearly reduced by levosimendan treatment, suggesting an overall gain in cardio-protection by levosimendan. In line with this, in a recent report by Malmberg et al. Myocardial apoptosis after induced by ischemia has been shown to be suppressed by levosimendan. In this report a demanding small animal model of ECC and global IRI was employed. The repro-ducible and robust character of IRI is strength of this model. However, as expected, the observed outcome of this model is the result of several effects beyond the pure IRI. Hemodilution associated with the priming volume and aggravated circulating makers of tissue damage associated with the whole body ischemia pattern are specific to this model. We defined a number of criteria to rule out major confounders of activation of signalling pathways, e.g. very low haemoglobin values during reperfusion, or failure of return into a ventricular rhythm. Owing to these exclusion criteria, a limited number of animals were included into this study, creating a preliminary character of this study. Our findings are limited in a number of ways. The relatively small group sizes are the main limitation of this study. Based on the small sample size, most observed effects did not reach statistical significance, despite partially large numerical differences. Retrospective power analyses showed that the most examined parameters need a group size ranging approximately between 10 and 20 animals in order to achieve statistically significant results. Therefore, future studies are needed. Nonetheless, Cohen’s effect size already showed large beneficial effects for the levosimendan treated animals regarding recovery of the heart rate after the circulatory arrest, the total amount of catecholamines required, the activation of IL-6 and STAT3, and notably the apoptosis rate. Furthermore, medium beneficial effects were found regarding buffers and activation of p44-24 MAPK. Analyses of cardiac biomarkers such as cardiac troponin T, CK-MB and BNP could extent the clinical impact of the study. Especially in future chronic experiments with weaning of the animals from the heart lung machine, circulating plasma BNP levels could serve as a marker for chronic heart failure and predictor of adverse outcome. Moreover, levosimendan pharmaceutical effectiveness is linked to calcium channels of cardiac myocytes. Current clinical studies suggest that the RyR2 channel may be linked to impaired patient outcome in the event of acute coronary syndrome. Therefore, changes of the ionic channels may act as a potential confounder of levosimendan treatment and need to be examined in the future. In addition, the usage of deep hypothermic arrest is nowa days clinically limited to extended aortic surgery and complex paediatric cardiac surgery. Nonetheless, this procedure enabled us to extend the ischemia time and facilitates the resumption of regular heart rhythm afterwards. Moreover, modifications of the presented model, e.g. ECC without hypothermia but with cardioplegia via retrograde aortic perfusion, are technically highly demanding in a small animal model. Future studies clearly need to extend group sizes as well as allow changes in application time and doses of levosimendan. In order to achieve larger group sizes, shorter ischaemias times at a higher body core temperature may result in comparable extend of IRI while potentially reducing the rate of dropouts. Weaning of the animals and catheter-based evaluation of ventricular function may represent additional readouts for future studies, although previous works focusing on hemodynamic and cardiac function have already proven the efficacy of levosimendan when compared to conventional isotropic drugs[24,25]. However, a recent study of London et al. revealed contrary results. Patients requiring hemodynamic support after cardiac surgery did not gain from additional levosimendan application with regard to perioperative morbidity and 30-day mortality. However, the patients involved in this study suffered from chronic ischemic disease with a remarkable proportion of pre-existent ischemic cardiomyopathy, while in our study healthy animals were exposed to profound ischemic injury. And yet, the rate of low cardiac output was by trend lower after levosimendan treatment, suggesting partial effects in the randomized controlled study. Regardless, our study demon-strates the level of circulating cytokines and intracellular pathways the potential of preventive levosimendan application in the context of ECC and global IRI. Preventive levosimendan application before extracorporeal circulation and extended ischemia and reperfusion affects circulating cytokine levels and key molecular salvage pathways as well as apoptosis in myocardial tissue. Levosimendan treated animals showed a faster recovery of cardiac rhythm, advantageous modulation of myocardial MAPK activation and decreased apoptosis in heart tissue, collectively indicating a potentially cardio-protective role of levosimendan. These findings may improve our understanding of levosimendan action in the context of extracorporeal circulation and ischemia/reperfusion, ultimately leading to a tailored application of levosimendan with maximized beneficial effects for patients suffering from major cardiovascular burden. This study was supported by institutional grants of the Dept. of Cardiovascular Surgery, Medical Faculty, Heinrich Heine University of Duesseldorf, Germany, and by a research grant of Cormed Medizintechnik (Rüthen, Germany). The authors are grateful to Susanne Bunnenberg Foundation for the generous support of the equipment of the laboratories of the Cardiovascular Center at the Medical Faculty of Heinrich Heine University Duesseldorf. 1. WHO. Global status report on noncommunicable diseases 2014. (2014). 2. GBD 2015 Mortality and Causes of Death Collaborators. Global, regional, and national life expectancy, all-cause mortality, and cause-specific mortality for 249 causes of death, 1980-2015: a systematic analysis for the Global Burden of Disease Study 2015. (2016) Lancet 388(10053): 1459-1544. 3. Doenst, T., Essa, Y., Jacoub, K., et al. Cardiac surgery 2016 reviewed. (2017) Clin Res Cardiol. 4. Beckmann, A., Funkat, A.K., Lewandowski, J., et al. German Heart Surgery Report 2015: The Annual Updated Registry of the German Society for Thoracic and Cardiovascular Surgery. (2016) Thorac Cardiovasc Surg 64(6): 462-474. 5. Goldberg, R.J., Spencer, F.A., Gore, J.M., et al. Thirty-year trends (1975 to 2005) in the magnitude of, management of, and hospital death rates associated with cardiogenic shock in patients with acute myocardial infarction: a population-based perspective. (2009) Circulation 119(9): 1211-1219. 6. Kunes, P., Lonsky, V., Mand'ak, J., et al. The inflammatory response in cardiac surgery. An up-to-date overview with the emphasis on the role of heat shock proteins (HSPs) 60 and 70. (2007) Acta Medica (Hradec Kralove) 50(2): 93-99. 7. Boeken, U., Feindt, P., Zimmermann, N., et al. Increased preoperative C-reactive protein (CRP)-values without signs of an infection and complicated course after cardiopulmonary bypass (CPB)-operations. (1998) Eur J Cardiothorac Surg 13(5): 541-545. 8. Jennings, R.B., Sommers, H.M., Smyth, G.A., et al. Myocardial necrosis induced by temporary occlusion of a coronary artery in the dog. (1960) Arch Pathol 70: 68-78. 9. Marfella, R., Rizzo, M.R., Siniscalchi, M., et al. Peri-procedural tight glycemic control during early percutaneous coronary intervention up-regulates endothelial progenitor cell level and differentiation during acute ST-elevation myocardial infarction: effects on myocardial salvage. (2013) Int J Cardiol 168(4): 3954-3962. 10. DeWitt, E.S., Black, K.J., Thiagarajan, R.R., et al. Effects of commonly used inotropes on myocardial function and oxygen consumption under constant ventricular loading conditions. (2016) J Appl Physiol (1985) 121(1): 7-14. 11. Sancho-Bru, P., Bataller, R., Colmenero, J., et al. Norepinephrine induces calcium spikes and proinflammatory actions in human hepatic stellate cells. (2006) Am J Physiol Gastrointest Liver Physiol 291(5): G877-G884. 12. Werdan, K., Russ, M., Buerke, M., et al. Cardiogenic shock due to myocardial infarction: diagnosis, monitoring and treatment: a German-Austrian S3 Guideline. (2012) Dtsch Arztebl Int 109(19): 343-351. 13. Land, S., Holohan, S.J., Smith, N.P., et al. A model of cardiac contraction based on novel measurements of tension development in human cardiomyocytes. (2017) J Mol Cell Cardiol 106: 68-83. 14. Pollesello, P., Ovaska, M., Kaivola, J., et al. Binding of a new Ca2+ sensitizer, levosimendan, to recombinant human cardiac troponin C. A molecular modelling, fluorescence probe, and proton nuclear magnetic resonance study. (1994) J Biol Chem 269(46): 28584-28590. 15. Sorsa, T., Pollesello, P., Solaro, R.J. The contractile apparatus as a target for drugs against heart failure: interaction of levosimendan, a calcium sensitiser, with cardiac troponin c. (2004) Mol Cell Biochem 266(1-2): 87-107. 16. Pathak, A., Lebrin, M., Vaccaro, A., et al. Pharmacology of levosimendan: inotropic, vasodilatory and cardioprotective effects. (2013) J Clin Pharm Ther 38(5): 341-349. 17. Maytin, M., Colucci, W.S. Cardioprotection: a new paradigm in the management of acute heart failure syndromes. (2005) Am J Cardiol 96(6A): 26G-31G. 18. Koster, G., Wetterslev, J., Gluud, C., et al. Effects of levosimendan for low cardiac output syndrome in critically ill patients: systematic review with meta-analysis and trial sequential analysis. (2015) Intensive Care Med 41(2): 203-221. 19. Lim, J.Y., Deo, S.V., Rababa'h, A., et al. Levosimendan Reduces Mortality in Adults with Left Ventricular Dysfunction Undergoing Cardiac Surgery: A Systematic Review and Meta-analysis. (2015) J Card Surg 30(7): 547-554. 20. Distelmaier, K., Roth, C., Schrutka, L., et al. Beneficial effects of levosimendan on survival in patients undergoing extracorporeal membrane oxygenation after cardiovascular surgery. (2016) Br J Anaesth 117(1): 52-58. 21. Qiao, L., Xu, C., Li, X., et al. Heart calcium sensitizer on morbidity and mortality of high-risk surgical patients with MODS: systematic review and meta-analysis. (2015) Int J Clin Exp Med 8(10): 17712-17720. 22. Tarkia, M., Stark, C., Haavisto, M., et al. Effect of levosimendan therapy on myocardial infarct size and left ventricular function after acute coronary occlusion. (2016) Heart. Mar 102(6): 465-471. 23. Kiraz, H.A., Poyraz, F., Kip, G., et al. The effect of levosimendan on myocardial ischemia-reperfusion injury in streptozotocin-induced diabetic rats. (2015) Libyan J Med 10(1): 29269. 24. Rungatscher, A., Linardi, D., Tessari, M., et al. Levosimendan is superior to epinephrine in improving myocardial function after cardiopulmonary bypass with deep hypothermic circulatory arrest in rats. (2012) J Thorac Cardiovasc Surg 143(1): 209-214. 25. Rungatscher, A., Hallstrom, S., Giacomazzi, A., et al. Role of calcium desensitization in the treatment of myocardial dysfunction after deep hypothermic circulatory arrest. (2013) Crit Care 17(5): R245. 26. Engels, M., Bilgic, E., Pinto, A., et al. A cardiopulmonary bypass with deep hypothermic circulatory arrest rat model for the investigation of the systemic inflammation response and induced organ damage. (2014) J Inflamm (Lond) 11: 26. 27. Pinto, A., Jahn, A., Immohr, M.B., et al. Modulation of Immunologic Response by Preventive Everolimus Application in a Rat CPB Model. (2016) Inflammation 39(5): 1771-1782. 28. Joshi, R.K., Aggarwal, N., Aggarwal, M., et al. Successful use of levosimendan as a primary inotrope in pediatric cardiac surgery: An observational study in 110 patients. (2016) Ann Pediatr Cardiol 9(1): 9-15. 29. Neumayer, C., Fugl, A., Nanobashvili, J., et al. Combined enzymatic and antioxidative treatment reduces ischemia-reperfusion injury in rabbit skeletal muscle. (2006) J Surg Res 133(2): 150-158. 30. Sardu, C., Carreras, G., Katsanos, S., et al. Metabolic syndrome is associated with a poor outcome in patients affected by outflow tract premature ventricular contractions treated by catheter ablation. (2014) BMC Cardiovasc Disord 14: 176. 31. Sardu, C., Santamaria, M., Rizzo, M.R., et al. Telemonitoring in heart failure patients treated by cardiac resynchronisation therapy with defibrillator (CRT-D): the TELECART Study. (2016) Int J Clin Pract 70(7): 569-576. 32. Sharma, H.S., Das, D.K. Role of cytokines in myocardial ischemia and reperfusion. (1997) Mediators Inflamm 6(3): 175-183. 33. Parissis, J.T., Adamopoulos, S., Farmakis, D., et al. Effects of serial levosimendan infusions on left ventricular performance and plasma biomarkers of myocardial injury and neurohormonal and immune activation in patients with advanced heart failure. (2006) Heart 92(12): 1768-1772. 34. Tasal, A., Demir, M., Kanadasi, M., et al. Comparison of single-dose and repeated levosimendan infusion in patients with acute exacerbation of advanced heart failure. (2014) Med Sci Monit 20: 276-282. 35. 35. Marfella, R., Barbieri, M., Sardu, C., et al. Effects of alpha-lipoic acid therapy on sympathetic heart innervation in patients with previous experience of transient takotsubo cardiomyopathy. (2016) J Cardiol 67(2): 153-161. 36. Sardu, C., Santulli, G., Santamaria, M., et al. Effects of Alpha Lipoic Acid on Multiple Cytokines and Biomarkers and Recurrence of Atrial Fibrillation Within 1 Year of Catheter Ablation. (2017) Am J Cardiol 119(9): 1382-1386. 37. Hausenloy, D.J., Tsang, A., Yellon, D.M. The reperfusion injury salvage kinase pathway: a common target for both ischemic preconditioning and postconditioning. (2005) Trends Cardiovasc Med 15(2): 69-75. 38. du Toit, E.F., Genis, A., Opie, L.H., et al. A role for the RISK pathway and K(ATP) channels in pre- and post-conditioning induced by levosimendan in the isolated guinea pig heart. (2008) Br J Pharmacol 154(1): 41-50. 39. Grossini, E., Molinari, C., Caimmi, P.P., et al. Levosimendan induces NO production through p38 MAPK, ERK and Akt in porcine coronary endothelial cells: role for mitochondrial K(ATP) channel. (2009) Br J Pharmacol 156(2): 250-261. 40. Stephanou, A. Role of STAT-1 and STAT-3 in ischaemia/reperfusion injury. (2004) J Cell Mol Med 8(4): 519-525. 41. McCully, J.D., Wakiyama, H., Hsieh, Y.J., et al. Differential contribution of necrosis and apoptosis in myocardial ischemia-reperfusion injury. (2004) Am J Physiol Heart Circ Physiol 286(5): H1923-H1935. 42. Malmberg, M., Vahasilta, T., Saraste, A., et al. Intracoronary Levosimendan during Ischemia Prevents Myocardial Apoptosis. (2012) Front Physiol 3: 17. 43. Ponikowski, P., Voors, A.A., Anker, S.D., et al. 2016 ESC Guidelines for the diagnosis and treatment of acute and chronic heart failure: The Task Force for the diagnosis and treatment of acute and chronic heart failure of the European Society of Cardiology (ESC)Developed with the special contribution of the Heart Failure Association (HFA) of the ESC. (2016) Eur Heart J 37(27): 2129-2200. 44. Santulli, G., Pagano, G., Sardu, C., et al. Calcium release channel RyR2 regulates insulin release and glucose homeostasis. (2015) J Clin Invest 125(11): 4316.